Product prices and availability are accurate as of 2019-04-09 19:08:56 UTC and are subject to change. Any price and availability information displayed on http://www.amazon.com/ at the time of purchase will apply to the purchase of this product. 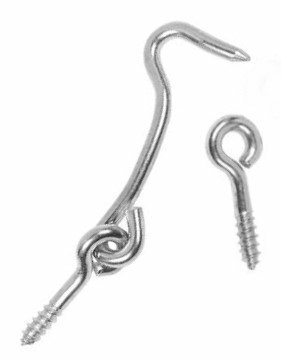 STANLEY SAFETY GATE HOOK & EYE Size: 2 Class CD8440-2 Double Coated Finish Zinc Plated Can be used to latch gates or doors and to fasten screen or storm panels. Sharp point bites into wood quickly, and easily. For use in exterior or interior applications. Available in rust resistant zinc plated steel or rustproof solid brass.